Only the most popular handheld lunch food "typically taken to work, school, or picnics" since the visionary fourth Earl of Sandwich purportedly threw together a Cold Cut Trio (no?) in between hands of poker in the mid-18th century, it's not at all surprising that you can't walk a block through Boston without hitting a spot that serves a great sandwich. 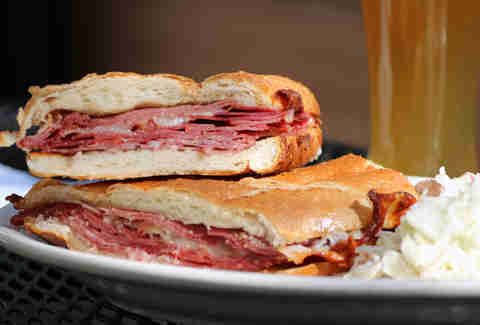 But what are the five tastiest, most creative, downright "best" sandwiches in all of the Hub? Good, albeit loaded, question. At the risk of engaging in a fool's errand, here are our five top handhelds that you need to eat right now. 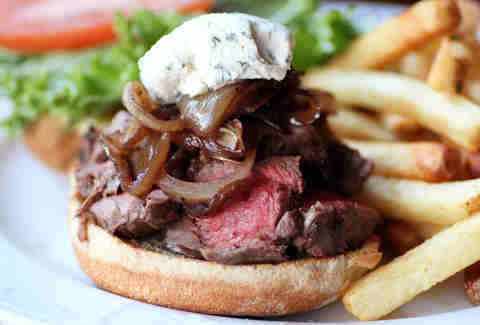 Absolutely worth having to ask one of the many homeless in Central Square for directions to get there, the filet mignon-tip sandwich at this eccentric neighborhood hangout is topped with boursin cheese and caramelized onions, and comes with salad, mashed potatoes, or fries. Although you'd be remiss if you didn't get fries, with an order of roasted garlic aioli for dipping -- it's ridiculous. Haha, no -- it's not 1995. We get it. That's funny. Seriously, Parish Cafe -- both on Boylston and Tremont -- continues to kill it when it comes to making some of the Hub's tastiest sammies, as is still evidenced by the lines you have to wait in to get a table. While the prosciutto-, capicola-, and soppressata-loaded Burke topped w/ Provolone and sided by a spicy red pepper relish takes best in show, the Schlesinger (an open-faced smoked ham & melted Monterey Jack w/ a mango chutney on banana bread!!) and Regal Regis aren't far behind. 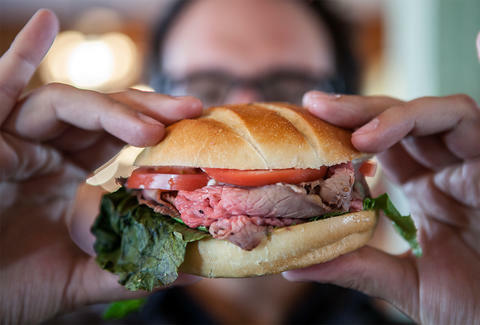 Since taking over the former Franky 'N the Boys spot in Brookline Village almost four years ago, this 16-seat gourmet sandwich shop continues to pile up the accolades, drawing rave reviews for their Roast Beef 1000 with Thousand Island dressing & crispy shallots, and the Saturday-only, slow-roasted pork w/ pickled fennel. 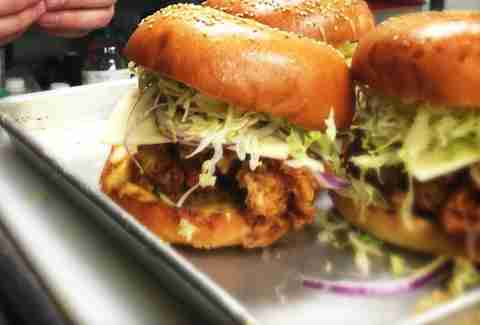 You'll want to wait for the one Sunday a month, though, when they serve nothing but their crunchy buttermilk fried chicken sandwich topped with melted cheddar and tangy honey-Dijon, and served on a buttered sesame brioche bun. Trust us. They start serving at 10a and go until they run out. 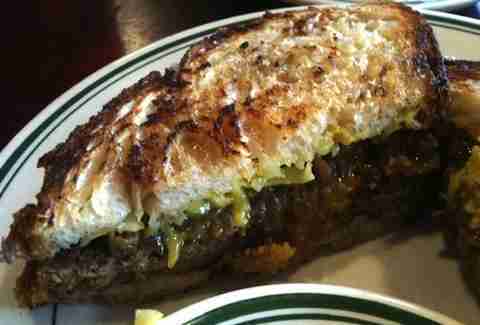 Hands down the star attraction at this popular, brothers-owned, Inman Square sandwich shop, the infamous Meatloaf Meltdown garners not one, but two spicy fire icons on the menu and brings together grilled meatloaf, Jack cheese, and caramelized red onion jam (all topped with a habanero-based "Inner Beauty Hot Sauce") on sourdough bread. Self-proclaimed purveyor of the "World's No. 1. 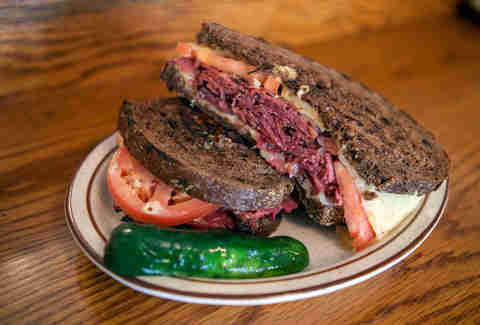 Sandwiches", this popular Hub institution's been slinging sammies in the DTX since the Tet Offensive, and -- while you can't go wrong with anything on the menu -- the place earns its rep with the Vermont cheddar-topped "Famous Rumanian" Pastrami Traveler's on grilled pumpernickel.